If Indravarman had only built the Bakong, he would have made artistic history. But that great temple was only one in a trinity of monuments that he and many later Khmer kings erected. The Bakong was in the form of the mountain at the center of the universe, and his royal cult was centered there. The second monument was much larger–the first of the great Barays. Barays were human-made reservoirs up to 4 miles long that were used for both irrigation and religious symbolism. They bolstered the king as the bringer of rains and life–an Eastern Pharaoh with an elephant army. But if you explore the third monument, Preah Ko, you might find it the most pleasing. We’ll venture into it right now. 1. 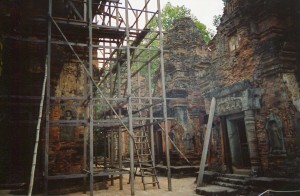 Indravarman built Preah Ko in 879–2 years before he constructed the Bakong. 2. Preah Ko’s central temple (pictured above and below) is on a much more human scale than the Bakong. This was the king’s private family temple, and thus it has a more intimate atmosphere. Preah Ko might not have been open to the public. 3. 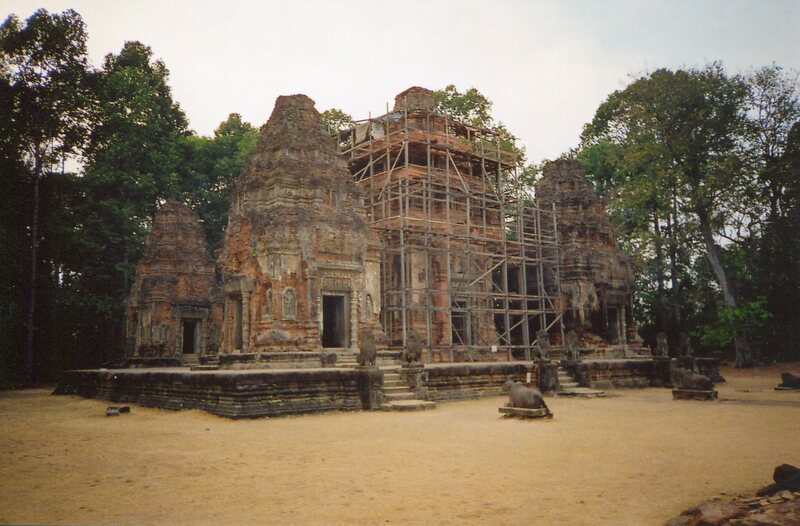 Preah Ko integrates 6 shrines on a platform. 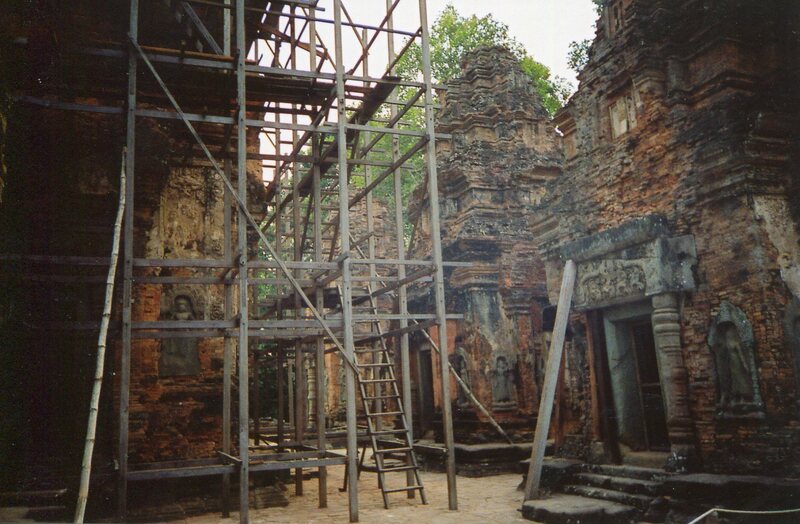 It was the first major Khmer temple to include several buildings on one base. This is one of Angkor Wat’s roots that grew from Preah Ko. 4. Ideologically, Preah Ko elaborated on old Khmer mixtures of royal spirits and a Hindu god. Indravarman dedicated it to Shiva, and to his own his ancestors. A tower represents each ancestor–three line the front row, and they stand for kings. The others are for queens, and they dutifully comprise that back row. Preah Ko was thus a turning point from the single-room Chenla shrines at Ishanapura and towards later Khmer glories. Khmers would continue to put several buildings on a single base and make this system more complex. And they would keep mixing Indian gods and local spirits. But Preah Ko has subtler aspects that were just as influential for the next 500 years. We’ll explore its inner secrets in the next post, Preah Ko. From now on, Khmer monarchs aspired to build all three types of structure: a temple for the ancestors, a public royal cult in the form of the cosmic mountain (like the Bakong), and irrigation projects.